In April 2013 Billy went to Des Moines, Iowa to accept Drake University’s Emerging Writers Award in Graphic Fiction for his novel in woodcuts, The Clown Genocide. Prints from this work have been exhibited in several shows in greater Cincinnati. Billy gave a talk about the woodcuts and met with students and faculty, and the prize-givers put him up in a hotel downtown. 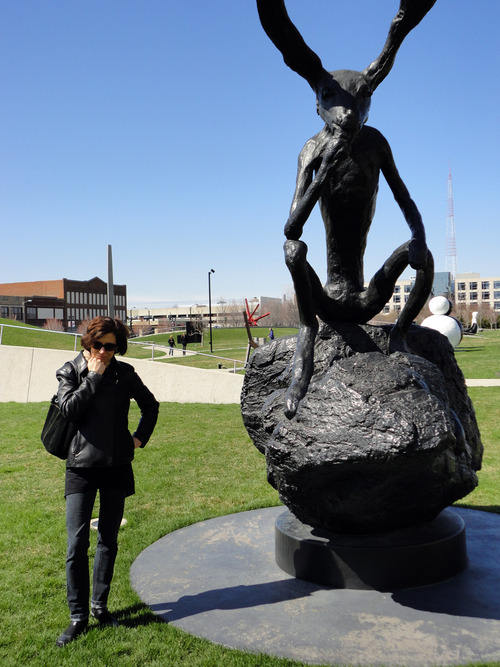 Margaret came out to join him after his stint as a celebrity artist and the two of them had a look around Des Moines. Billy took a few snaps and as usual sent them my way. I didn’t hear much about his talk, but what is there to say about a work called The Clown Genocide? The title is self-explanatory. Billy has also cast several bronze clowns, one of them with the usual red nose and a butcher’s knife planted in his forehead, another a clown preparing for the guillotine, another a clown with a spear in his side. That might be his Clown Saint Sebastian. I would almost say that clowns and violence are a key motif in Billy’s work. There’s a lot of cruelty in comedy, as everybody knows. But so far the clown is not a part of Billy’s photography, even if his pictures aren’t always dead serious. 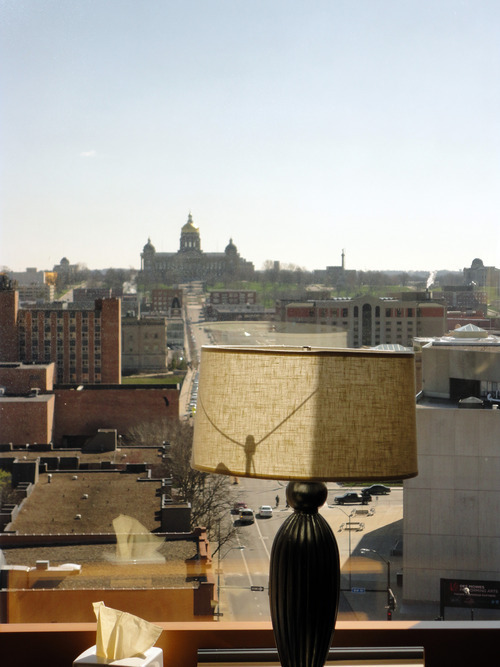 Here we have a photograph taken through a hotel window and showing the gold dome of the Iowa State Capitol in the distance. Billy has framed the shot with the lamp. The lampshade seems to be half lit and half dark, balanced like good and evil in our world, though they say that good is supposed to triumph in the end. This is not an expensive hotel, judging from the lamp. I haven’t been to Des Moines in a long time, and when I was there years ago I was really only passing through. That was before people started talking about flyover states—I guess I might have thought of Des Moines as a drive-by city then, as in “drive-by shooting.” In those days one heard a lot about crackheads and meth labs there. But things are looking up in Des Moines. It has become a hotbed of art and culture. Now that Drake University has had Billy out to talk there’s no stopping Des Moines. Unless Billy has a timer for his camera and hopped over to pose in front of this pondering rabbit, Margaret deserves the credit for this photograph. The sculpture is not meant to be a rabbit but rather a hare, however; this is one of a series of hare sculptures by the late great Barry Flanagan. Flanagan illustrated a book by one of my favorite poets, Tom Raworth, but it is his sculptures he’s best known for. This one is called Thinker on a Rock and dates from 1997. 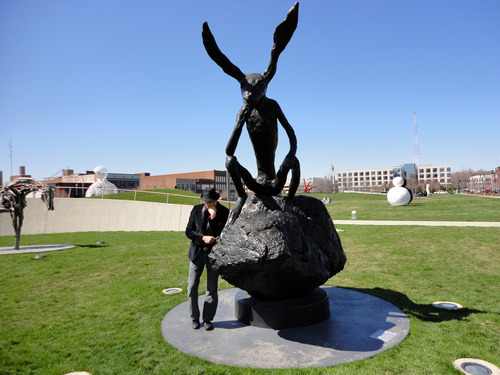 Billy and Margaret found it in the Pappajohn Sculpture Park outside the Des Moines Art Center, where they also had a chance to see outdoor work by Sol Lewitt, Louise Bourgeois, Jaume Pleusa, and other famous artists. You can read all about Flanagan and see images of his work at the posh website maintained by his estate: http://barryflanagan.com/artworks/browse/. Flanagan traced his interest in the hare to his childhood memory of seeing one on the Sussex Downs. I don’t think I have seen a hare in the wild, and I don’t know much about the differences between hares and rabbits, except that hares are longer and faster and have bigger ears. Flanagan said that seeing the famous horses at the Basilica San Marco—the ones on display are copies, I think—spurred his interest in sculpting animals. The hare is the clear winner in his catalog. There’s the Six Foot Leaping Hare on Empire State, Hare and Helmet, Nijinski Hare, and many more. Still, for my money Pondering Rabbit would be a better title for this hare. The thinker part of the real title comes from Rodin, of course, but it’s easier to imagine the lanky critter pondering than thinking, if you know the difference. Billy is wearing a fedora that I recognize and trying to pose like the hare. What a ham Billy is. Under that silly hat he is losing his—okay, you saw that one coming. This is a photograph of Margaret, Billy’s better half, the bright sun shining on his clownish moon. In seeking to take up the pose of the sculpted hare thinking, Margaret is resting her chin on her right hand and her other hand on her hip, whereas Billy has chosen to prop his chin upon his left hand while gently touching the hare’s rock stool with his right. It was very subtle of Billy to plan it this way, though I am not sure what it means. Throughout the traditions of art and myth, the hare is often present, representing different things—from a demiurge present at the creation of the world to garden variety sexual promiscuity or swiftness. So much for hare symbolism! In real life the Mountain Hare, Irish Hare and Snowshoe Hare, and all the other hares, are shy, much more so than rabbits. That must be why I have never seen one in the wild. Bugs Bunny is not shy and he is a hare, or he was a hare in A Wild Hare (1940). There seems to have been some confusion about his identity after that. I am not sure what the man dressed up like a bunny in The Bunnyman Massacre is supposed to be. Barry Flanagan would roll over in his grave to see Hollywood trash like that. Margaret looks like she is having a good time in this picture, so I’ll give her the last word from Des Moines.